With the perfect blend of coconut and almonds surrounded by a dark chocolate coating, this protein bar doubles as a great-tasting meal replacement snack and after-workout recovery bar. 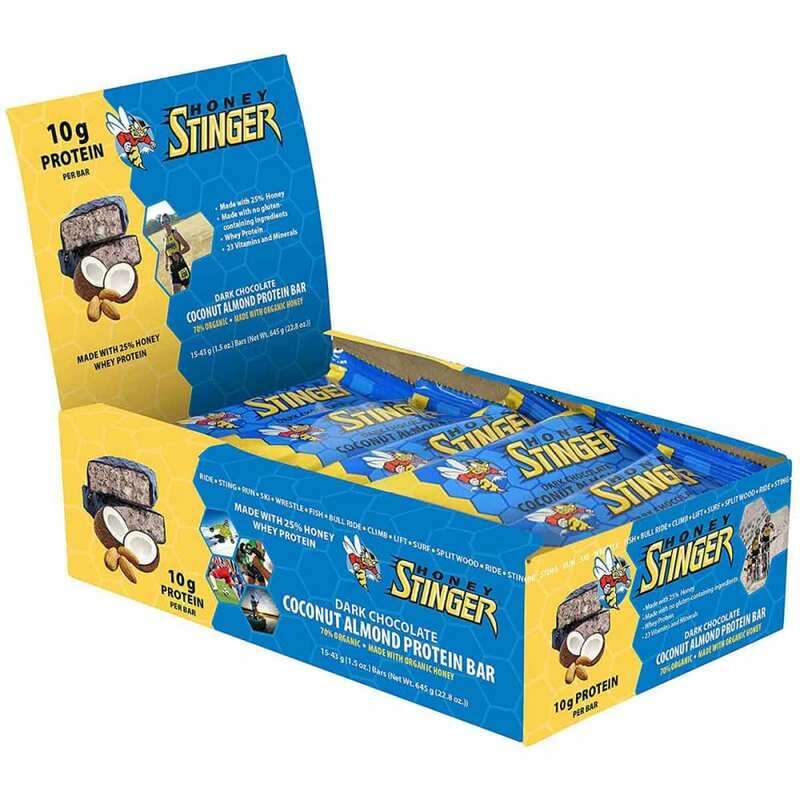 The Dark Chocolate Coconut Almond Protein Bar contains gluten-free ingredients and zero trans fats in combination with over 25% USDA Certified Organic honey, 10g of whey protein (20% RDA), 23 vitamins and minerals, calcium, and antioxidants. Ingredients: Organic Dark Chocolate [Organic Sugar, Organic Chocolate Liquor, Organic Cocoa Butter, Organic Soy Lecithin added as an emulsifier, and Organic Vanilla], Organic Honey, Whey Protein Isolate, Organic Almonds, Coconut, Less than 2% of the following: Natural Flavor, Dicalcium Phosphate, Dimagnesium Phosphate, Ascorbic Acid, Maltodextrin, Magnesium Oxide, Niacinamide, Ferric Orthophosphate, d,l-alpha Tocopheryl Acetate, Manganese Sulfate, Zinc Oxide, Potassium Iodide, Vitamin A Palmitate, Biotin, d-Calcium Pantothenate, Sodium Molybdate, Pyridoxine Hydrochloride, Thiamin Mononitrate, Riboflavin, Sodium Selenate, Chromium, Chloride, Cupric Oxide, Folic Acid, Cholecalciferol, Cyanocobalamin. Allergen Statement: Contains Milk, Soy, Coconuts and Almonds. Made in a facility that also processes Peanuts, Tree Nuts, Egg, and Wheat.